Inspired by an exquisite piece of hand-painted silk, this collection has an beautiful Asian influence. 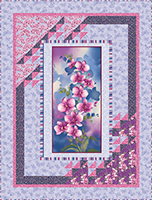 The Orchid Panel can be stretched and hung as a work of art (embellish with embroidery and beading if you wish). Or… combine it with the allover prints as the center of a beautiful bed quilt. The look of hand-painting will bring a touch of luxury to any project.